| Talent is often highly overrated…. Home > Blog	> Talent is often highly overrated…. Talent is often highly overrated…. Every year I try to learn something new, or achieve a new goal. Over the years, I have learned to fly, taught english in Bangkok, written a book, run a marathon and took a scuba diving course on The Great Barrier Reef. 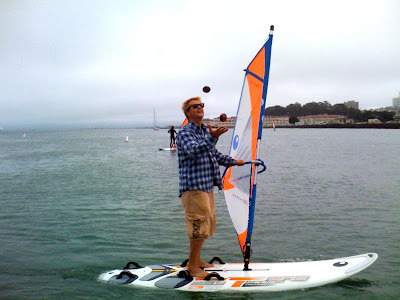 This summer I decided to learn how to windsurf. It all happened quite suddenly, in July I took an extra long weekend, went to a friends cottage & spent one afternoon on the water on one of their boards. I was hooked. The night I got home, I went on Kijiji & 2 hours later, was the proud owner of a used windsurfer. For the past 6 weeks I have been out almost every day. To be frank some people are natural athletes, I am not, but I am persistent. Today was the last day of my vacation, I have been on the water all 9 days, I fallen a lot, & got towed back to the cottage once, I was about 1 km out on the lake & the wind died. A fellow cottager noticed me stalled for about an hour & came out to get me. (He was once stranded 4 km from shore on Lake Ontario, when the same thing happened to him). Today, I had an “epic” sail, with the combination of the right amount of wind & the last few weeks of practice, it all clicked. How do you get your career to click? You can listen to my podcast with Daniel Coyle, author of The Talent Code. The main thesis of his book is that talent is often overrated. There are many talented people, but the research from Daniel’s book shows that those that excel in any arena, have a balance of discipline, smart training and a supportive professional team around them. Learning to job hunt, managing your career, or becoming a great manager all have this in common. Like learning to windsurf, they are skills that you need to work at, get some support & sooner than later you will end up mastering them. Continue the conversation on our Facebook fan page or my blog. What makes your career click? wn patrol, along the road with you! P.S. Need help with getting your career to click? Join The Career Identity Program, this 1-1 framework is a great way to get personal support & take control over your future.